Springmoor offers a floor plan to fit your lifestyle – a small alcove apartment, a one or two bedroom apartment, a villa or a two-bedroom house. 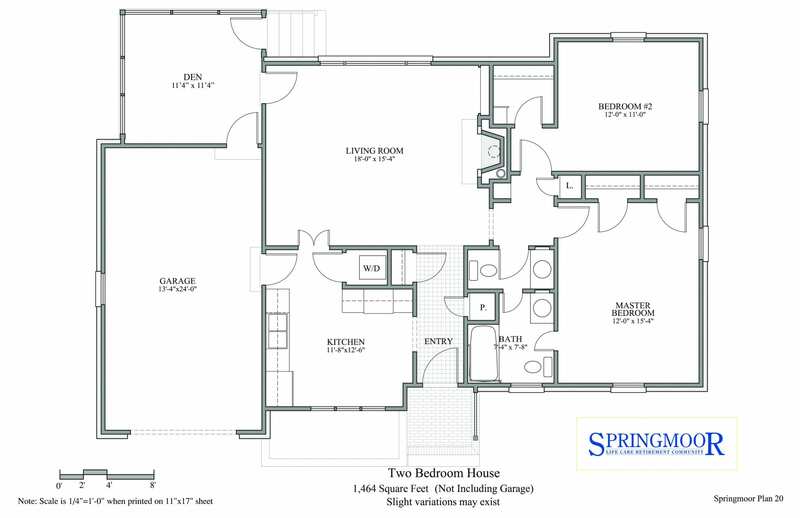 The floor plans vary in size with our alcove at just under 500 square feet to a two-bedroom deluxe house with a garage at 1,602 square feet. We offer over 18 floor plans on our 42-acre campus. 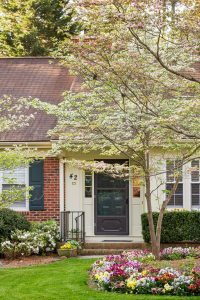 There are 21 two-bedroom single-family homes nestled around a wooded cul-de-sac and down the beautifully landscaped Springmoor Drive. 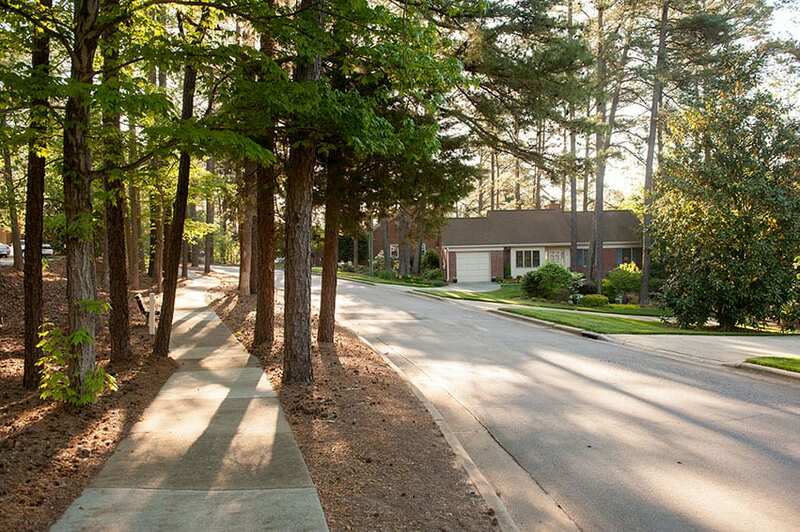 The two styles, each with a single car garage, vary slightly in square footage and layout. When our residents choose their floor plan, they quickly begin to visualize the arrangement of their furniture in each room. 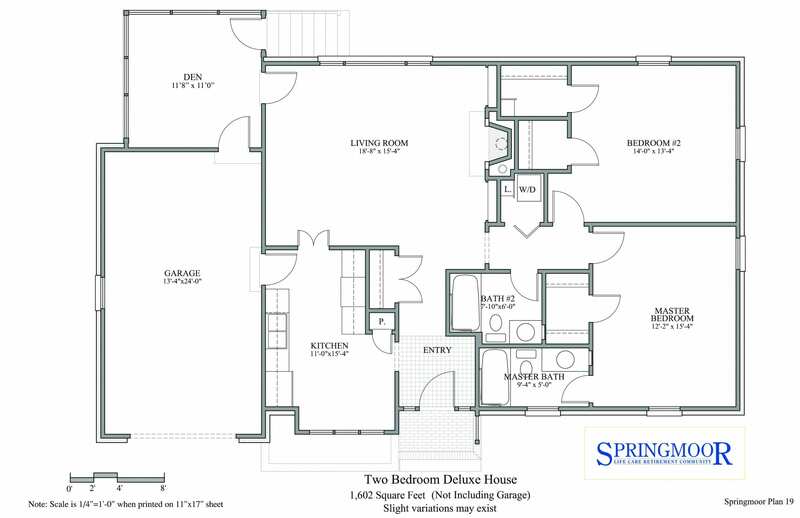 The master bedroom in both floor plans is approximately 12’ x 15’. Comfortably making room for a king-size bed, bedside tables and dressers. A reading chair or desk can fit into this spacious room too. Residents often design their own closets. We help plan them to fit their individual needs with shoe shelves, double and single hanging bars, coat hooks and sweater shelves. The second bedroom becomes a guest room or an office and sometimes both. With this 12’ x 11’ or in the deluxe floor plan, a 14’ x 13’ bedroom there are endless possibilities for making this room fit your needs. Some residents have made this an art studio or a library while others have created an office with his and her desks. There are rooms with twin beds for grandchildren and rooms with a double bed and chaise lounge for reading or watching your favorite movie. 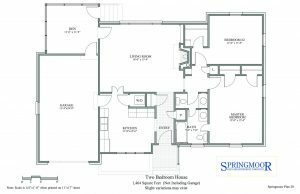 Moving from a large home to this comfortable floor plan is not difficult when you begin to see the many possible arrangements for your favorite pieces. The two-bedroom houses all have a den on the back corner of the house. Two walls of windows invite wonderful light into the room. 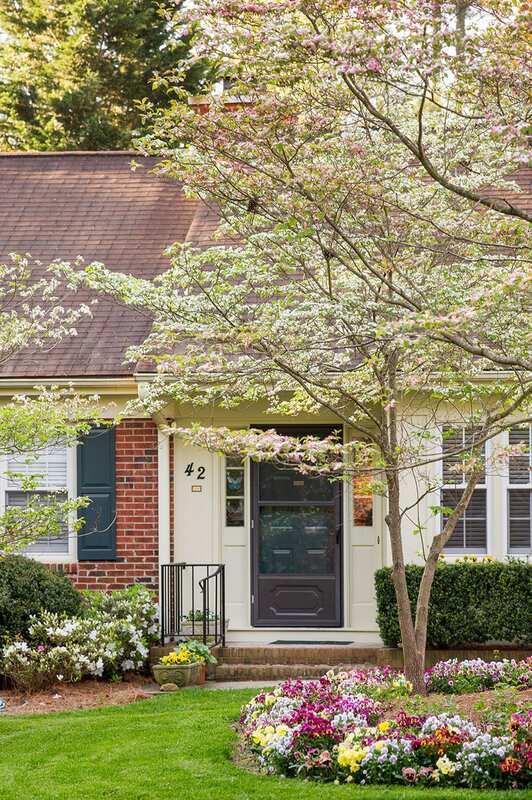 Covered with our 2” white faux wood blinds, the windows show off the variety of trees and shrubs in the community. A bank of North Carolina pine trees, dogwoods and azaleas, surround the houses located around the circle. 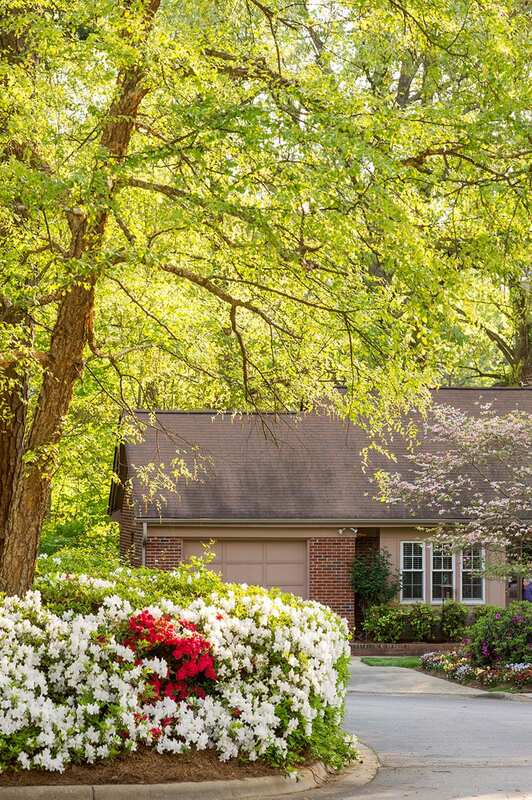 (And don’t forget, our landscapers are there to trim them and clean up brush and debris on a weekly basis. Your time can now be spent doing the things you like to do!) The den for most families becomes an office or a TV room. Filled with your favorite chair or a computer desk, it is hard not to enjoy this wonderful room. The living room, complete with a gas-burning fireplace, has more than enough room for a living and dining room combination. Most residents still prefer to use their eat-in-kitchen for their breakfast table. For those with larger families that want to continue to entertain around the dining room table, the space can easily accommodate your table for six. The kitchens are equipped with a dishwasher, disposal, refrigerator, range and full-size microwave. Both floor plans include a pantry too. The cabinets can be individually designed with pullout shelves, baking racks and/or glass cabinet doors, making your kitchen unique to your style. 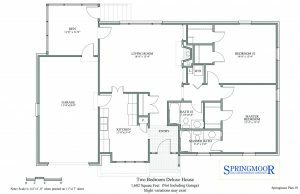 The two floor plans vary between a bath and a half and two baths. Shower stalls or tubs are available. And both styles offer a washer and dryer in each house plus a pull-down attic space and a single car garage. Extra storage space is possible in the roomy garage or in the large entry closet. Rightsizing from your home of forty years may seem like a daunting task but choosing from one of these homes makes it an easier task when you consider the new lifestyle ahead. Entertainment is offered several evenings each week. There is a library, a bank and a hair salon on campus. A Wellness Center for exercising, a movie theatre and four independent living dining options make Springmoor an easy choice for your move. And if needed, our out patient clinic is staffed every day all day. Maintenance, landscaping and housekeeping are taken care of by our staff. We want you to enjoy your well-deserved free time in your new home whether it is an alcove style apartment or a single-family house. Our marketing counselors are happy to give you a tour and assist you in making the right choice for your lifestyle. Please call 919-234-7626 to make an appointment.